We look forward to continuing to enable organizations across a variety of industries to leverage Microsoft technology to reinvent their digital strategy. 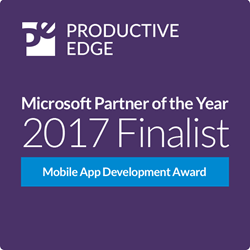 Productive Edge, a Chicago-based global Digital Transformation consultancy, is named a top Microsoft Partner of the Year finalist for mobile app development. The company is recognized for their extensive work with Xamarin and Azure technologies, with specific acknowledgement of their mobile solution that helped a Fortune 100 healthcare provider transform care delivery for Medicaid patients. Productive Edge is a global Digital Transformation consultancy headquartered in Chicago, Illinois with two international offices in Eastern Europe. They specialize in Modern Mobility, Custom Software, Virtual Reality, Digital Experience, Big Data, Blockchain and Cloud solutions for the Enterprise. Additionally, the company offers R&D services (R&DaaS) for enterprise clients to identify and explore the potential use of emerging technologies. Productive Edge subsidiary, EDGE Experiential, specializes in employing the use of Virtual and Augmented reality technology to create revolutionary experiential marketing solutions.